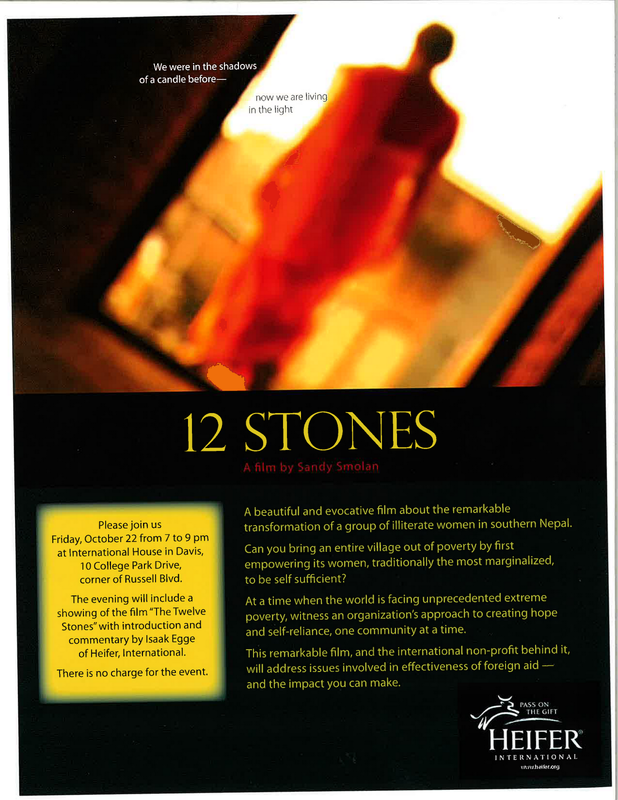 12 Stones Film, Heifer Speaker, Nepalese Dancer...Come Join in the Fun! Sacramento area volunteers, Suzanne Awalt and JoAnne Peter, are featured on "In the Studio," a local program airing on Davis Community Television's public access Channel 15 and online at http://dctv.davismedia.org/show/23304. In the program Suzanne Awalt and JoAnne Peter describe how Heifer International works at a grassroots level. The show also highlights a local screening of the documentary called "12 Stones" about Heifer International which will be shown from 7 to 9 p.m. Friday, Oct. 22, at International House, Davis, 10 College Park. a wake up call and was both informative and inspiring. Marshal McKitrick’s original folk songs spoke of challenging realities in our world but within a larger context of optimism and faith in the human spirit. Doug Crawford and Every One in Rhythm closed the show by facilitating a vibrant drum circle. Everything went like clock work much to the relief of MC John Brewer. in setting up a Children’s Table where kids made rhythm instruments some of which were played later at the drum circle. 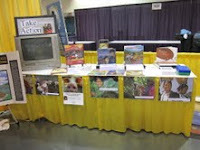 Sue Bennett set up her Dinner Around the World display, which was a real eye opener. Cheryl McKinney put together animal button sashes along with a reference booklet with “what your choice of animal says about you” fun blurbs along with how the animal makes a difference in the lives of our project partners. This provided an ice breaker as people entered; Cheryl was ably assisted by Amy Flindt, Noriaki Kono, and Susan Sundell. Suzanne Awalt handled the information table with grace and aplomb. Total donations added up to $4,046; after costs, $3,786 was sent to Headquarters. But who can quantify the long term impact of this event on the enhanced awareness and future acts of service which may issue from participants who were inspired by involvement in this event. On a windy Sunday morning in Sacramento, Heifer volunteers participated in an Earth Day Fair after services at Spiritual Life Center. For some attendees, this event was their first introduction to Heifer International, and they seemed especially impressed with Heifer's fundamental cornerstone, "Passing on the Gift". 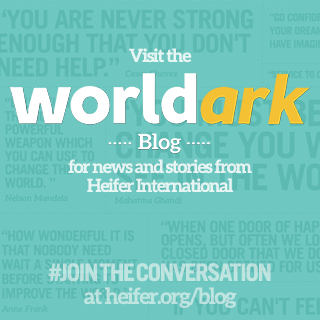 We were pleased to learn that many others were already familiar with and supportive of Heifer's work around the world. 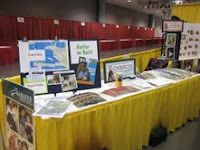 A live worm bin and Heifer's world wide worm farm information poster drew a lot of interest and questions. The booths were tended by Michael De Santis, Lisa Maloney, Judy Grimshaw and Pat Sayer-Handley. A free festive event is offered by Heifer International volunteers to benefit relief and redevelopment in Haiti (donations gladly accepted). Enjoy a Haitian meal prepared by Patrick Celestin of Celestin's restaurant on K Street along with a performance by award winning Haitian musician Rosemond Jolissaint, a lively Haitian drum piece by Bob Scarlett and Everyone In Rhythm, folk songs by the talented Marshal McKitrick, an inspirational presentation by one of Heifer's best speakers, an original poem by local poet John Bowman and, finally, an interactive drum circle, facilitated by the inspirational drummer himself, Doug Crawford, in which you will be invited to participate. RSVP would be appreciated but not required. Mahaney Regional Park in Roseville was the setting for the annual "Celebrate Earth Festival" on Saturday, April 17, 2010. The event was just one in a week-long menu of earth-friendly activities hosted by The Roseville Utility Exploration Center that directs both a hands-on learning expo and a variety of eco-wise classes for the public at the Mahaney Park site. The festival focused on empowering our citizens to nurture and conserve the earth and its resources in sustainable ways. A variety of exhibits demonstrated wise energy and water use, eating locally-grown food, "green" travel and recycling. 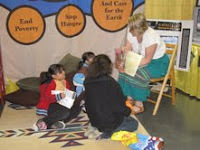 This was Heifer's second year at the event that had an expected attendance of 3,000 people. Sacramento-area volunteers challenged children, youth and adults with interactive questions on economics, nutrition and food production, animal agriculture and global citizenship, while educating about Heifer's mission to help hungry families feed themselves and care for the earth. As always, it was a great day to be a Heifer volunteer, sharing our passion with friendly, caring people in a beautiful setting. 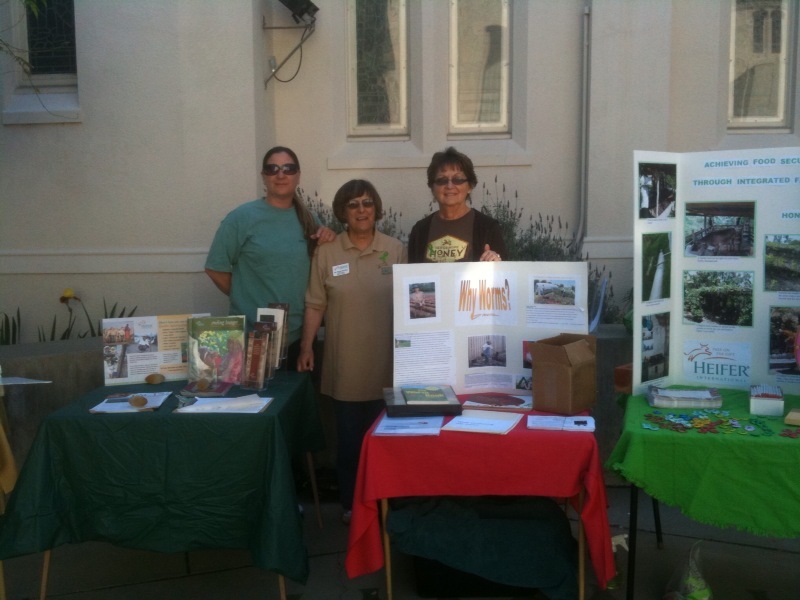 On April 3, The Sacramento Heifer volunteer group participated in the annual Zoo Fest at the Sacramento Zoo. 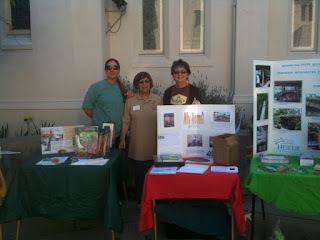 Six volunteers spent the day giving out information about Heifer's work. The featured animal was bees and many children stopped at our booth to make bee wrist bands and lollipop flowers. In spite of cool weather, there were many visitors to the zoo and we felt we had a very successful day. 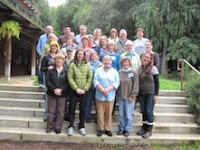 Three Sacramento Heifer volunteers attended training at Hidden Villa in Los Altos Hills, California. 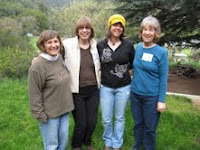 The three volunteers from the Sacramento region joined twenty three other volunteers from California and other western states. There were presentations from Heifer staff on various projects around the world, including the United States. One of the highlights of the training was a presentation on Heifer community planning and the 12 cornerstones by Tererai Trent, formally of Zimbabwe. Tererai, who is featured in the book Half the Sky by Nicholas Kristof and Sheryl WuDunn, was an inspiration to everyone. The volunteers developed program goals which will be shared with other volunteers in their regions. Seven Sacramento area volunteers traveled to Fresno for Girl Scout World Thinking Day on Feb. 27 at the Fresno Convention Center. 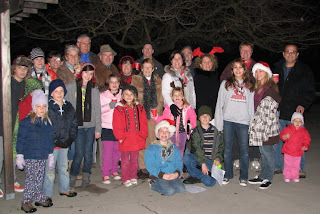 The theme was "Working together, Girls Scouts can help end hunger and poverty" and Heifer was the featured charity. 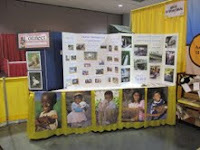 We had a large booth with a great variety of activities and resources for both the girl scouts and the adults. The girls were enthusiastic and interested visitors to our booth. Many waited in line to spin the spinner to win a variety of prizes.